What’s your unit’s electronics policy? Should you allow your Scouts to bring their smartphones on camping trips? Sure, Scouters and Scouts can do it all with these powerful gadgets. A smartphone (or tablet) is a watch, an alarm clock, a digital compass, a camera, a GPS navigator, a Boy Scout Handbook, a constellation map, an encyclopedia, and a guide to tying knots—all in one device. Costs and size are down, while battery life and cell coverage are up. And with those factors in mind, many troops, teams, and crews now allow Scouts to carry an iPhone, iPad, Android device, Windows Phone, or BlackBerry on campouts—with certain restrictions, of course. Still, how did Scout units come to that decision? And if Scouts can bring their smartphones or tablets camping, how can you ensure that they don’t abuse the privilege? For some Scouters, it’s a black-and-white issue: No electronics are allowed at Scout events. “If boys want to play with electronics, they should stay home,” says Steve S.
“No electronic devices by the boys. Adults can bring phones, but they are to be used for emergencies only. Campouts are a time to enjoy nature and what the good Lord gave us. It also ensures we focus on the basics without the distractions,” adds Charles N.
“Scouts don’t need phones. Ask your parents if they had phones back in the day. Scouting is about nature and being one with your surroundings,” shares Jimmy H.
“Smartphones have a lot of games on them, and getting the Scouts to pay attention is next to impossible when you’re trying to give instructions and they’re playing on their phones,” Frank M. writes. “All I have to say is” What happens when there is no power? Scouts need to know how to use the basics: map, compass, brain,” says Jim W.
“Asking scouts to give up technology for a couple of hours or a weekend will NOT render them incapable of fitting into a tech-savvy society,” says Tammy N.
“We allow phones if they pass the camp test. With a tent stake driven through it and it has been submersed in water for 10 minutes, if it still works, sure they can use it,” jokes Jim E.
Many troops, teams, and crews only allow smartphones, game systems, MP3 players, etc., while driving to and from a campout. During the event, they’re locked in the vehicles. “They can bring it and listen to music during travels, but under NO circumstances is it to be brought out or used during the campout. It will get confiscated and returned when we get home,” says Justin K.
“Leave them in the locked vehicles once we arrive at the campsite or trailhead. If you need it to tell the time, then buy a watch,” adds Jason P.
Several Scouters have developed specific, nuanced electronics policies for campouts. There’s even an unofficial “Tech Chip” for Scouts to earn by promising to be responsible users. Only Scouts with the Tech Chip can use electronics in troops that use this strategy. “Our new troop has an electronics policy: Scouts above a certain number of camping nights in the previous year may have electronics. Said electronics must be off and out of use prior to 9 p.m. or end of activities (whichever is later) and after 7 a.m. Exceptions granted for Scouting uses only. This means they can text after activities, check the ballgame scores, or, more commonly, listen to music before sacking out. The restriction on nights camping precludes “new” Scouts from calling home at the first snap of a twig. The right to use electronics can be rescinded as well and the counter reset,” writes Damon E.
“I came accross the Tech Chip that was created by Troop 479 in Eden Prairie, Minn. This is NOT an official BSA award. But we have started using in our troop. As technology continues to evolve and become more and more embedded in every part of our lives, Scout leaders need to continue to make use of it. By teaching courteous use, Scouts and adults can take advantage of technology to create a safer outdoors experience without reducing the value of the experience for others,” shares David M.
“Electronics should be allowed when appropriate for the activity. Alarm clocks for wakeup, GPSs for geocaching, etc. But let’s face it: many Scouts will lack the discipline to avoid casual texting, music apps, etc. … and few things are more disrespectful than trying to teach a class to Scouts with earbuds in their ears! Units that opt to allow electronics devices should set clear rules with clear consequences,” says Tammy N.
Not just allowed — encouraged! It’s 2012, and some Scouters said that means we should be embracing technology as an organization. “For better or worse, these kids are growing up in a generation that is totally ‘connected.’ As much as you may want to change that, you’re fighting an uphill battle. We as leaders need to recognize that “things change, all the time, whether we want them to or not.” Asking our predecessors whether they had cell phones is an apples to oranges comparison — they didn’t exist! As leaders we should not allow our fears, preconceptions, and/or misconceptions drive our dictations to the Scouts. 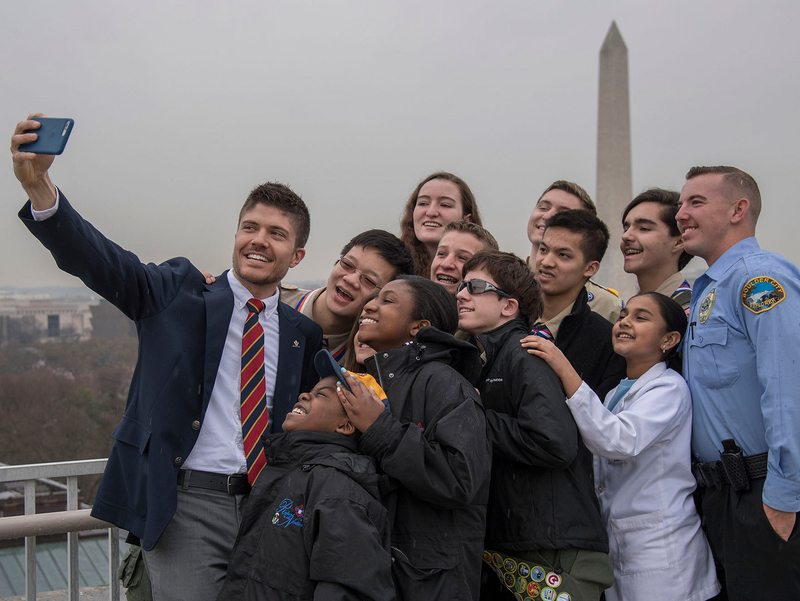 It’ll just be one more reason why youth don’t join,” writes Nic C.
“As a Cub Scout leader looking into the future of Scouting, I think we will need to allow them for the sake of keeping current and relavant. Many hiking publications are now recommending that hikers ditch all of their paper maps, separate GPS, and other similar equipment for one “smartphone” or “smart pad” with a solar charger. As always, it may be a challenge to keep the kids from using them for video games, but I think if they are taught how to use them as tools, it will be worth it,” posits Amy I. “Our crew welcomes electronics. Learning when to use them with discretion is a life skill that is good to learn. They are a modern tool that prepares Scouts for today,” saysReggie L.
“If you are worried that the boys will spend all day in their tents playing Angry Birds on their phone (or playing Rummy with a deck of cards, for that matter), then the adults and Scout leaders obviously did not have an adequate schedule of activities planned for the trip,” writes Tami D.
“There is nothing I see wrong with it if they are used respectively. Why not allow our kids to photo and blog the things that make us proud? I don’t think we should have a issue with that,” says Yvette S.
“I talked to the Jamboree staff, and cell phones will be allowed at the 2013 National Scout Jamboree. They even have charging stations. I think we should trust the boys — they are Boy Scouts, and they follow the Scout Oath. Talk to them about appropriate uses for their phones. And then embrace technology, and use the phones when appropriate. Plus, as a mother, it makes me feel more comfortable when my son has his phone. He wants to conserve the battery for an emergency, so is not tempted to play games on it,” adds Sheila T.
Which comment(s) above do you agree with? What’s your pack, troop, team, or crew’s policy on smartphones? Continue the discussion by leaving a comment below. Thanks to Patrick Adams, my first Scoutmaster, for the blog post idea. Photo by Flickr user tvol.